A petrified giant was discovered to great excitement in rural New York, but all was not as it seemed. Upstate New York in the 1860’s was the site of possibly the greatest hoax in American history. Certainly it was very financially success for the perpetrators and others. In 1868, George Hull, tobacconist, of Binghamton, New York was annoyed with his local preacher, Reverend Tuck. The reverend was found of giving fire and brimstone sermons. He would quote Genesis “There were giants on the earth in those days.” So George Hull decided to take the preacher at his word. He lived in the New York state town of Binghamton, but he didn’t think his town needed a giant, but Cardiff, New York did. Hull bought a 5 ton block of gypsum stone in Iowa and had it shipped to a stonecutter in Chicago. The stone was shaped into a rough figure of a giant man. Then the maker, Edward Salle, used darning needles to punch holes into the stone, to resemble pores. The figure was also rubbed with sand and sprayed with ink and sulfuric acid. It cost Hull about 2,600 dollars to have the stone made and buried. Hull then has his huge stone man transported to his cousin William Newell’s farm near Cardiff. Then Hull waited for over a year before actually setting his hoax in motion. On October 16, 1869, Newell sent some workers to dig a well behind his barn, right where the 10 foot giant had been buried. The workers soon stumbled upon the giant and told the “surprised” farmer all about it. Thousands of people began flocking to the Newell’s farm to see the petrified man. It was the subject of general amazement, some thinking it was a petrified man and some sure it was an ancient statue. Newell had the dirt dug out from around the figure and erected a tent over the stone man. Newell then started charging 5 cents per person and thousands paid the fee. Even when the admission fee kept going up, the crowds kept coming. The statue was soon bought by a group of businessmen for 37,500 dollars and moved to Syracuse so more people could see and wonder at the giant. 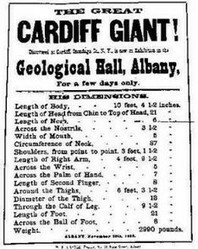 PT Barnum soon realized what a great money-maker the Cardiff Giant was and tried to buy it for 60,000 dollars. But the businessmen refused the offer, which turned out to be a mistake. Barnum was no fool, he knew the giant was just a fake, so he had no compunction about having a replica made, which he put on exhibit in New York City. The fake soon became more popular than the actual stone man. The businessmen sued Barnum, but the judge said he would dismiss the case unless the Cardiff giant’s owners could prove their stone man wasn’t a fake. They couldn’t, so they dropped the charges. Scientists had quickly grown skeptical about the giant. Some pointing out that there were still chisel marks on it. It was declared to be a clumsy fake, but a couple of scientists briefly believed it was a genuine fossil. Most visitors didn’t care, they just wanted to see the giant. The original fake stone man can still be seen at the Farmer’s Museum in Cooperstown, New York. Barnum’s fake was exhibited at his museum for years, but the plaster man is now lost in time.